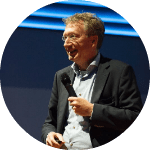 Gerard Scheenstra is a creative entrepreneur/incubator, seasoned professional, disruptive thinker and doer, coach, trainer and guest lecturer/speaker. Gerard has since 1986 work experience in multiple roles as a professional in different lines of business and entrepreneurship. To make people and organization agile and ready for the future makes Gerard happy. It is my personal belief that each person should take the responsibility for the development of his or her own life and career. You should make it your personal mission to develop your own sustainable employability profile during your life and help others to achieve and/or develop it. People with high level of sustainable employability profile will be more innovative as a person and add innovative value to organizations they work for or in. To create a global Knowvium community based on the key values of Passion, People, Pleasure, Planet and Profit.